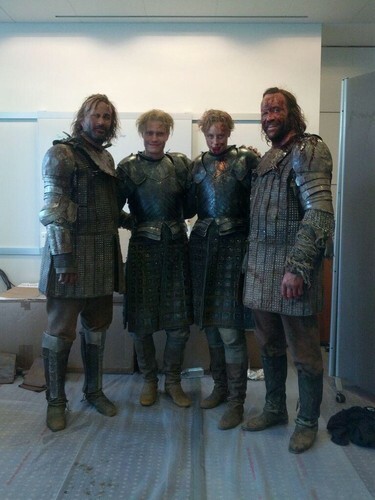 Gwendoline Christie and Rory McCann with their stunt doubles. . HD Wallpaper and background images in the Game of Thrones club tagged: photo game of thrones season 4 gwendoline christie brienne of tarth sandor clegane rory mccann stunt doubles. This Game of Thrones photo contains kijani beret, vikosi maalum, askari wasomi, askari wa wasomi wa green beret, and vikosi maalumu. There might also be vita mavazi, mavazi ya vita, fatigues, kombati, navy muhuri, muhuri, and muhuri wa jeshi la majini.